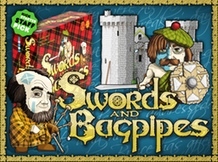 Something a little different today, caught sight of this just now and thought it was pretty unique, a tabletop board game about the first war of Scottish independence featuring bagpipe cards and a map of Scotland on the board. Each round, the players, representing noble houses of Scotland, are asked to choose a side in the current battle—either to ally with England or stand for Scottish independence. It’s an interesting idea, one that could make for a fun strategy game on the PC, reminds me a bit of a Scottish twist on the old Sid Meier game Colonisation actually. I like the idea of any piece of media featuring Scottish pipers so I could be tempted to pick this up. The company is apparently based in Florida so I don’t know how Scottish it truly is but still an interesting curiosity for sure. It does make me wonder if any other games, be they board games or video games, have prominent roles for Scottish pipers on their bagpipes. Can’t think of any myself but if you can feel free to let us know in the comments section below, thats why it’s there! ← Something I love about Glasgow….